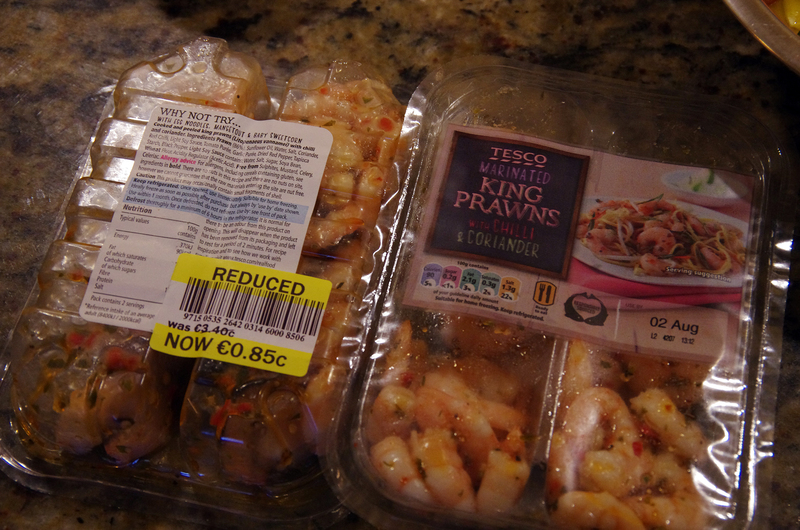 I’ve recently been on an economy drive and also decided to get healthier after over doing it on holiday this summer. I don’t know about you, but whenever I diet or start a ‘health kick’, I tend to end up thinking of nothing but food. As a result I’ve been torturing myself by watching loads of cookery programmes, one being Jamie Oliver’s ‘Jamie’s Money Saving Meals’ on Channel 4. Now the following recipe isn’t from the show, but the show did get me trying to use up as much of the produce in the fridge as possible. 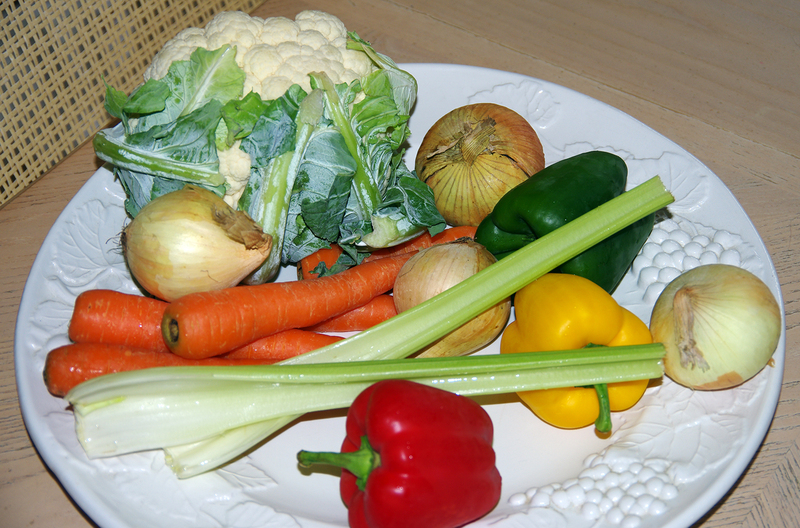 We’ve become pretty bad at over-stocking the fridge of late and by the time we venture to the back, the food is out of date and we end up throwing it away…it’s primarily vegetables that end up in the bin. This really grates on me, so I’m hoping that we can change our ways and save a bit of money in the process. *Fingers crossed* This recipe is a good way to use up those stray vegetables lurking in the back of the fridge, so I thought I’d share it with you. Note that the images at the bottom of this post are using approximately double the amounts shown in this recipes following details as I tend to make loads and use it throughout the week. Fill the kettle with water and boil. You’ll be needing the water for the couscous and peas. 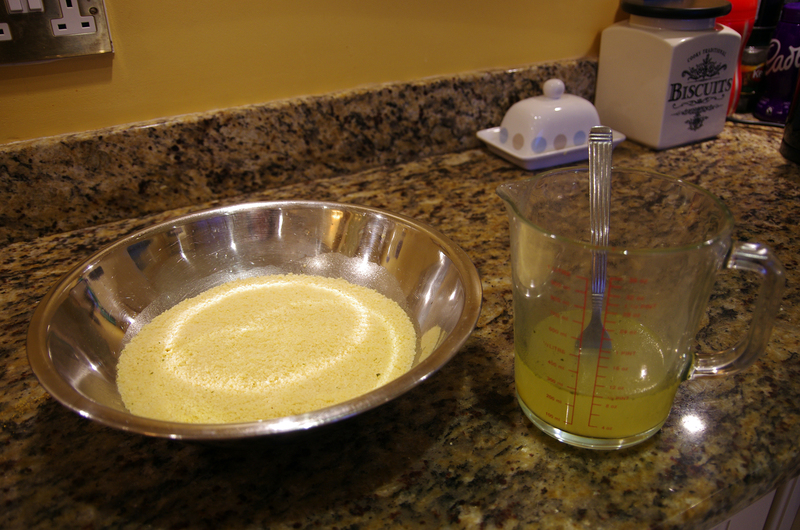 Put your couscous into a LARGE bowl, (one big enough to accommodate the swelling couscous and the veg when it’s cooked). 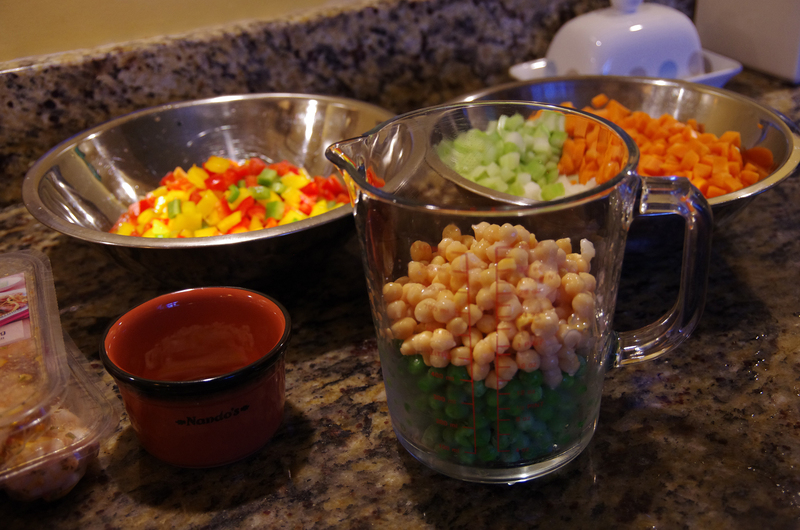 Make the jug of stock using the boiling water and your choice of stock cubes and pour over the couscous. Just enough to cover the couscous. Cover the bowl with a tea towel and get on with preparing the veg. (Remember to stir the couscous from time to time and add more of the stock when the previous lot has been absorbed) I use the best part of a half a jug of stock to one cup of couscous. It only takes about 5 or so minutes to be fully absorbed. Open and strain the tin of chick peas. Give them a quick wash under a tap to remove as much of the slime that accumulates in the tin. Put the frozen peas and the chick peas together in a microwavable bowl. Cover with boiling water and cook on full power for about 2 minutes (or whatever it says on your chickpea tin) When cooked, strain them and put to one side. Finely chop some garlic and place to one side. 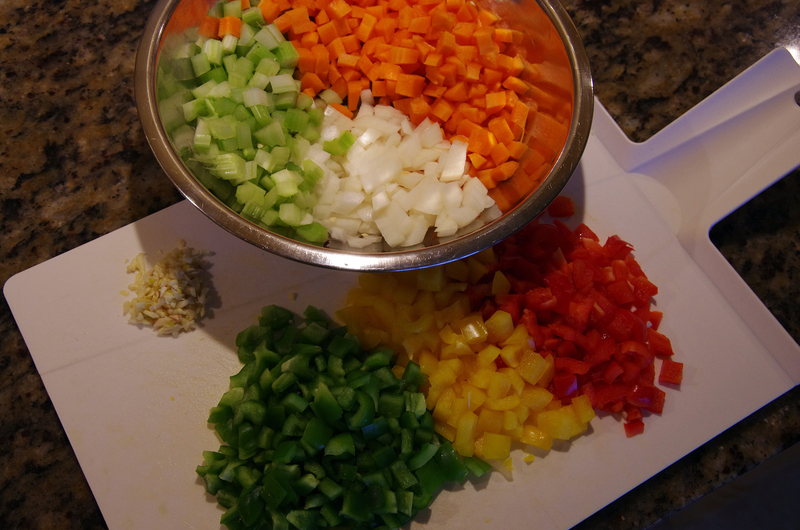 Finally chop the carrots, celery, onion and place them in a bowl. Heat a drop of olive oil or vegetable oil in a deep, large frying pan. 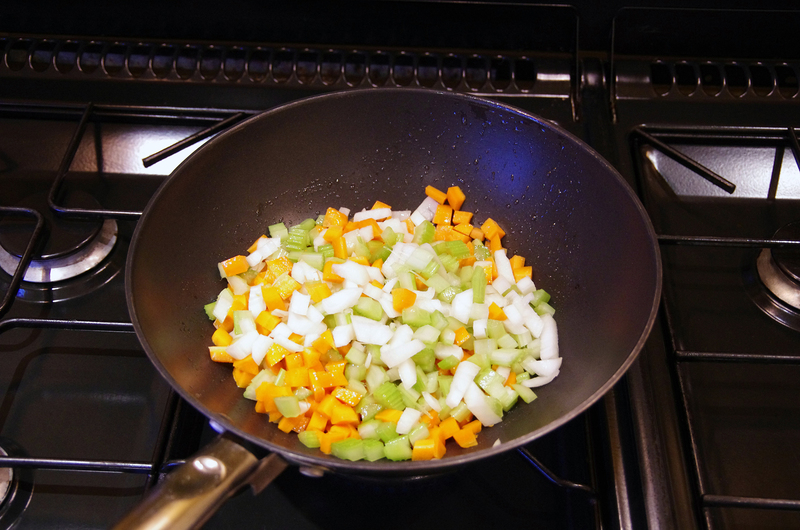 Add the bowl of onions, celery and carrots to the heated pan and cook until the onions start to go soft, but not browned. This only takes a few minutes…3-5 minutes. 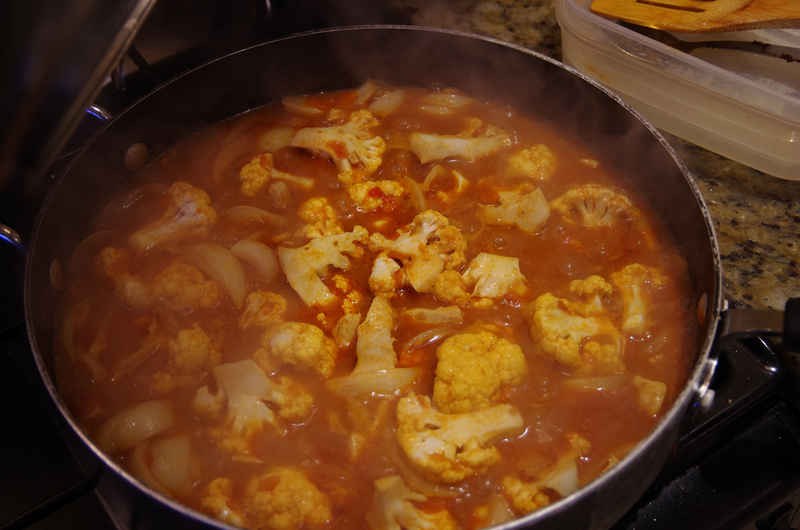 Add the curry powder to the veg in the pan and mix thoroughly. I add quite a lot because I like the flavour. 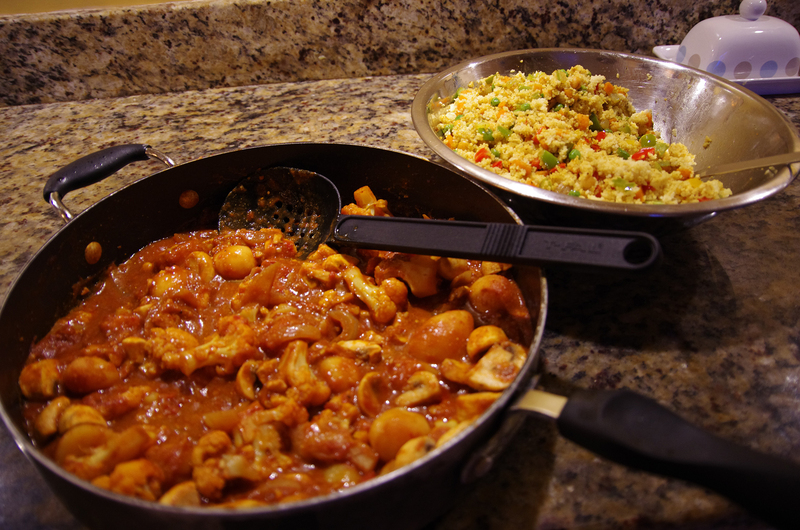 In this particular batch I used my madras powder as I’d run out of curry powder. Next add the garlic, bell peppers, peas and chick peas and a bit more curry powder. 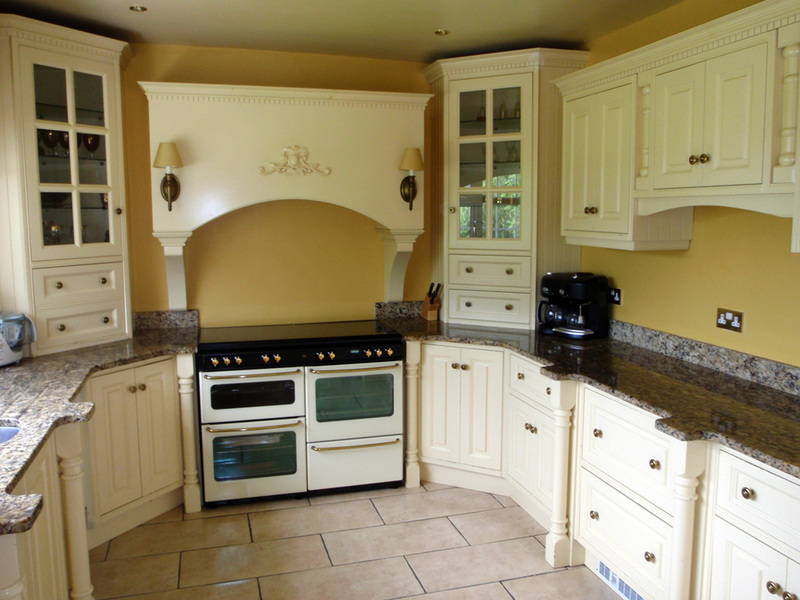 Ensure it all looks well coated in the curry powder and fry off until everything is cooked through. Again, this only takes about 3 or 4 minutes. 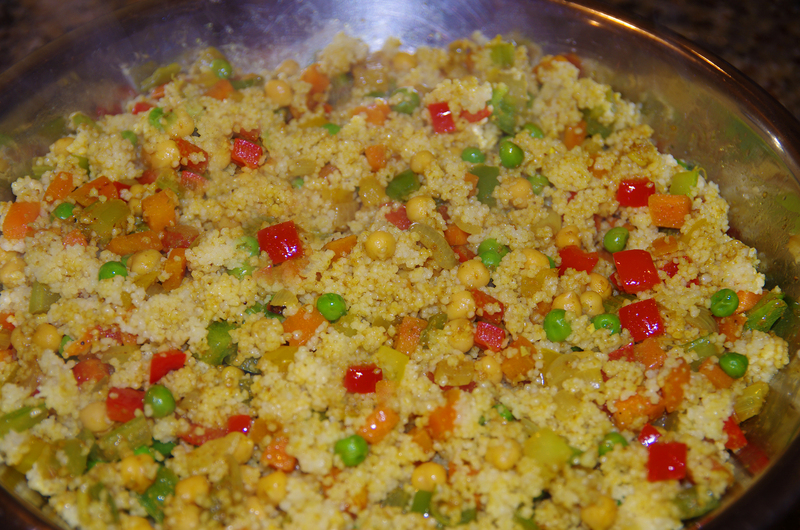 Once the contents of the pan are cooked and the couscous is nice and soft, add the pan of veg to the bowl of couscous and mix together. 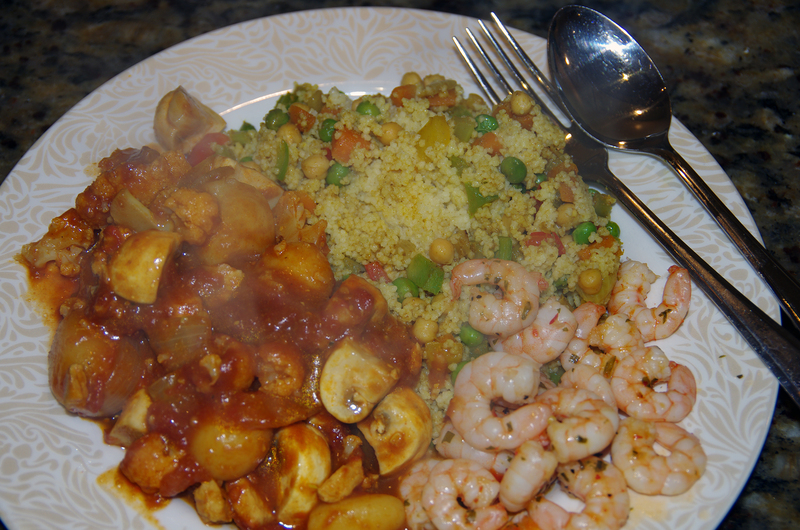 Alternatively you could add the couscous to the frying pan and give the couscous a quick warm through, but I tend to make too much to fit in the pan, so I add the veg to the bowl of couscous instead. 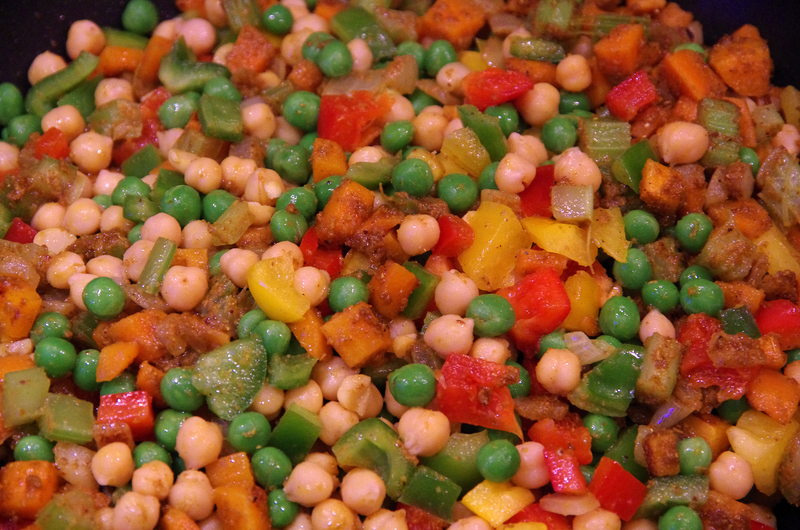 Any leftover curried couscous can be refrigerated and used over the course of the week. I have it with various curries and chillies, with salads, in pita bread with left over meat etc. It’s particularly nice warmed up with cold, diced tomatoes mixed through it. 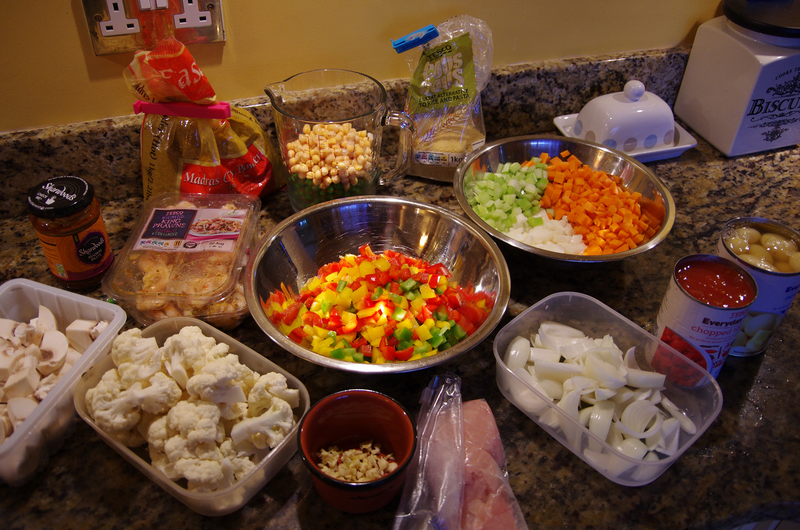 Take One Kitchen and a Whole Heap of Neglected Veg…..
A Few Stray Veggies Rescued And Used In Veg Curry and Curried Couscous. Thank you for taking the time to read this post and if you do try the recipe, I hope you enjoy the food.